Hosted by Subcontractors Assoc. of the Metroplex. Greg Strudwick of T.E.A.M Safety will be speaking about his favorite subject – Safety – with an emphasis on OSHA compliance and the proper way to handle an OSHA onsite inspection, as well as explain the “OSHA Citation Policy” and the proper response if in fact a citation is issued after the fact. Greg will also present a simple but effective way to create a “Jobsite Safety Analysis (JSA)” and “Job Hazard Analysis (JHA)” that is not only user friendly, but, if used on a consistent basis, will help to thwart a potential citation. PCL’s annual Thank You Party is our chance to thank all the great industry professionals we work alongside to help our clients succeed and improve our great construction industry. Let us all give thanks together as we kick off the holiday season. This event is for underwriters, CPAs, attorneys, bankers, insurance agents, consultants and other contractor supporting professionals that are good friends of PCL. It’s that time again – time to start thinking about preparing for the next round of tax returns. Join us for a great and informative presentation by Lance Trammell and Donna Nuernberg of Lane Gorman Trubitt, PLLC on this important and timely topic. Tami LaGrone and Karen Ensley of Cutler-Smith will provide you with the tools to understand the criteria used by governmental agencies to classify your labor force as employees or independent contractors, and discuss the perils of misclassification. Tami and Karen will then walk you through the I-9 compliance process to ensure you have the tools to survive an ICE audit. Subcontractors who subcontract out all or a portion of their work face unique challenges in their obligations to their customer and their lower tier subcontractor(s). Ricky Locke of Independent Insurance Group and Spike Cutler of Cutler-Smith, PC, will cover subcontract agreement must haves, payment obligations, flow-through provisions, many possible insurance issues and much more. Subcontractors take on the majority of liability as liability is pushed from the owner to the general contractor and finally to them so the ability to review subcontracts and understand how language in the agreements create potential traps is important to survival. In this seminar Spike Cutler will guide us through the traps old and new so you can negotiate your way to a fair and equitable contract. We will also cover bond forms and new “gotcha” language for controlled insurance programs (CIPs). This seminar is being presented through the Subcontractors Association of the Metroplex (SAM). 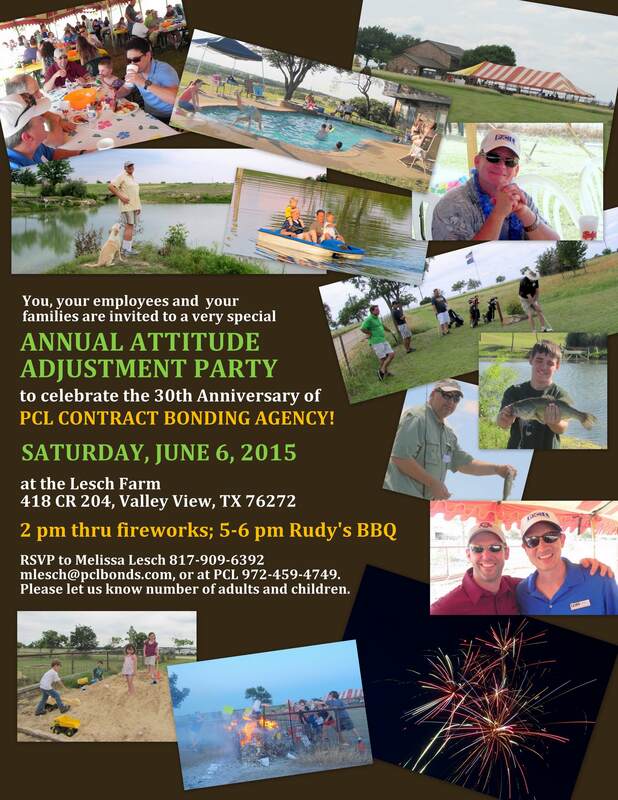 Save the date by marking your calendars for the 31st anniversary of PCL! No Seminar – Enjoy the Holidays! This is our annual party to celebrate all the great industry professionals that we work with and of course the kickoff to the holiday season!